How does an air filter work on an airline? What is operational principle of pneumatic air filter? May 19, 2017, 5:14 a.m.
Filter removes liquids and solids by swirling the air inside the bowl. Centrifugal force will separate particles also the air has to change direction and push through a filter witch will remove any remaining particles. 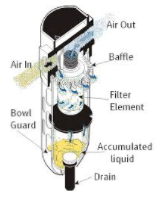 Particles and water fall into the quit zone below the baffle. May 19, 2017, 5:18 a.m.